Star Trek Deep Space 99 space station. Deep Space Nine (DS9) is a fictional space station in the science fiction television series Star Trek: Deep Space Nine. The station serves as a base for the exploration of the Gamma Quadrant via the Bajoran wormhole, and is a hub of trade and travel for the sector's denizens. 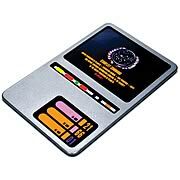 It is run by a joint crew of Starfleet and Bajoran officers, and it is the home port of a number of Starfleet runabouts and the USS Defiant. The station and its crew play a vital role to the events surrounding the Bajoran sector, the wormhole, and the Dominion War. Deep Space Nine, over a kilometer in diameter, is composed of a broad outer docking ring; an inner habitat ring containing residences; and a central core containing the promenade, the fusion reactors, and the operations center, known as "ops". Three sets of docking pylons sweep up and down equidistantly around the docking ring, defining a spherical shape. It is of identical design to Empok Nor. In its current position at the mouth of the wormhole, the station is three hours away from Bajor by shuttle. Originally a Cardassian mining and refinery station named "Terok Nor" in orbit around Bajor, it was built by slave Bajoran labor under Cardassian rule in 2351. The station was commanded by Gul Dukat, the last Cardassian prefect of Bajor. It was abandoned toward the end of the Cardassian occupation of Bajor in 2369; the Cardassians removed anything of value on their way out. In 2369, the Bajorans assumed control of the station. The Bajoran provisional government requested the assistance of the United Federation of Planets, who renamed it Deep Space Nine (DS9) and placed Commander Benjamin Sisko in command. Despite the Federation presence, the station remains subject to Bajoran law. Shortly after Sisko assumes command, his crew discovers the Bajoran wormhole. The station is moved to the mouth of the wormhole to secure Bajor's claim to it, after which the station assumes great commercial, scientific and strategic importance. After the encounter with the Dominion in 2371 and owing to other volatile conditions, the station is retrofitted and heavily armed. The station's full complement of weaponry includes 5,000 photon torpedoes, several phaser banks, and shields that extend 300 meters around the station. These upgrades are first used against the Klingons in their offensive against Cardassia in early 2372. At the beginning of the Dominion War in late 2373, the station is temporarily lost to the Dominion. In early 2374, Federation and Klingon forces retake it after the Battle of Bajor. Aside from a failed Bajoran military coup, the Dominion's occupation, and a brief leave of absence from late 2374 to early 2375, Sisko, promoted to captain in 2371, remains in command of Deep Space Nine. In late 2375, at the end of the Dominion War, Colonel Kira Nerys assumes command. 1/12, 1/18, 1/24, 1/43 scale Star Trek Deep Space 9 Diecast models from all the top manufacturers including AutoArt, Maisto, Bauer, Bburago, Minichamps, Motor Max, GMP, Road Legends, Motor City Classics, UT Models, ERTL, Kyosho, Signature Models, Precision Miniatures, Sun Star, First Gear, Exoto, Hotwheels, Welly, Highway 61,Greenlight, Jada Toys, Johnny Lightning, Ricko, Revell, Shelby Collectables.